“Crazy In Love” – A walk-through exhibit on display in the student center ball room. See how many early warning signs of a dangerous relationship you can identify! I was between classes, and I had about an hour to kill when a representative from the Women’s Center handed me their flier. I didn’t have anything better to do while waiting for my next class, and the flier sparked my curiosity, so I figured why not? When I entered the ball room, I found a row of “stalls” covered by curtains and a pair of young girls waiting at a table to instruct those arriving to tour the exhibit. They motioned me over, handed me a piece of paper, and explained what I was to do. Each “stall” depicted the bedroom of a college student as it would have been found at different stages in her relationship, and between each stall was a computer set to play a vlog post from this student. As I entered each room, I was to peruse and examine, looking for “clues”. Feeling a bit like a private investigator, or Sherlock Holmes, I was intrigued and ready to piece together the puzzle. 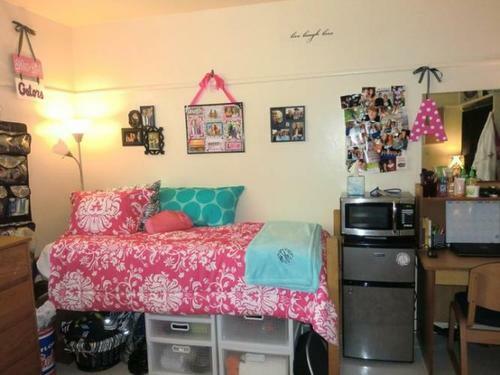 The room was fairly typical of what would be expected of a college dorm. An open journal detailed the first meeting with the new boyfriend. A calendar on the wall indicated important dates – tests, study meetings, gym workouts, scheduled outings with friends, sorority activities, scholarship interviews, etc. There were pictures of friends and family on the walls, magazine cut-outs of potential purchases for the room, graduate school applications on the desk. It was easy to see that the girl who slept in this room was a hard-working, goal oriented individual with an active social life and a healthy drive for success. The first vlog showed this peppy, happy girl introducing her new boyfriend to her family. Said boyfriend seemed eager to make a good first impression… and stake a claim on his new “territory”. I couldn’t help but notice his almost uncomfortably close proximity to his girlfriend through the whole video, arm draped over her shoulders and keeping her hand in his without ever letting go. Another journal entry indicated that though they’d only been together a few short weeks, the girl and her new boyfriend were now engaged and planning on moving in together. She seemed to be madly in love. Infatuated, even, and the rest of her “plans” had taken a toll. Calendar dates for outings with friends were crossed out, cancelled, and replaced with “quality time” with the boyfriend or shopping trips to look for bridal gowns or other preparations for the wedding. A “to do” list indicated a need to pick a date, a honeymoon location, and other various pre-wedding preparations. The stack of applications that had been on the desk in the previous room was now on the floor – the desk flooded with bridal magazines and cruise advertisements. Little post-it notes from the boyfriend were scattered across the room, critiquing everything. The second vlog showed a still “peppy” girl, now, however, intent on convincing her family that they weren’t taking things too fast, as they were just so hopelessly in love. The boyfriend was a little less interested in making a good impression now, and was instead focused on correcting statements made by the girlfriend. Now the room is flooded with messages from the boyfriend. Plans for an outing with friends are overlapped by a note stating “I thought you were going to spend time with me?” or “I thought you weren’t going to hang out with this person any more?”. Hopeful images for bridal gowns were plastered on the wall with question marks and synonymously shut down by the boyfriend with commentary that one was too revealing, another too expensive, etc. A phone log indicates missed calls from concerned friends and sorority members, a missed interview, and even professors concerned about late assignments. The journal entry now indicates that they’ve been fighting, and that the boyfriend got worked up enough to hit her during one of their arguments. The third vlog shows a now disinterested boyfriend who has to be called to come to the screen and seems too busy to engage. The girl is telling her family that they are getting a dog, but the boyfriend isn’t willing to agree on a name. When he goes off-screen, the girl apologizes to her family for their delay in completing the vlog and blames their difficulties on the stress of wedding preparations. The boyfriend has now completely taken over. Everything is a chaotic mess of beer bottles, ash trays, cards… The attempted wedding preparations are buried under dirty clothes and pleading notes are shot down by further criticism. The journal entry is now written from the point-of-view of the boyfriend who indicates his distaste with his girlfriends decision making skills and his need to be there with her every moment for shopping and preparations to help save her from her own poor taste. A nasty note on the calendar demands the girlfriend get the room clean before his plans for having the guys over for another card game and drinks. At this point, someone else who’d been going through the rooms gives a dismissive cluck, rolls her eyes, and comments “so dramatic”… Meanwhile, I’m reaching a breaking point. With each room, I’ve felt my heart-rate increasing, my breathing becoming slightly shorter and more shallow. It’s not a fun puzzle anymore. I’ve numbed myself and am just going through the motions, trying to get through to the end without thinking. I can’t let it sink in. Can’t let it process. But that comment… “so dramatic”… seems to break open the flood gates. I get one glance into the final room. I see broken glass on the floor, smeared with the streaks of bloody finger prints, and I snap the curtain closed. I can’t step in that room. I can’t. Before I know it, I’m striding across the ball room floor and heading for the nearest bathroom, where I break down in sobs. Gasping, panting, pacing… The scream. The blood. The glass… It’s too overwhelming. And over and over, ringing in my head, is that offhand comment – “so dramatic”. It takes me almost thirty minutes to calm down enough to leave the bathroom, but my nerves are shot. I skip my next class and go back to my apartment instead, but I can’t stay inside. It’s too confining. I feel trapped. Like I’m suffocating. So I take my dog out for a walk in the fresh air and finally am able to settle down enough to quiet my mind when I find a nice cool patch of grass to lie in with my dog standing guard over my prone form. The “Crazy in Love” display had been spot on. The “clues” in each room had worked like triggers, bringing memories of my own experience flooding back in waves. I could identify characteristics of my abuser in the boyfriend, characteristics of myself in the girl. Each room represented a stage in MY relationship with my now ex-husband. Each vlog represented MY emotional state at different stages in my abusive relationship. It was superbly executed. Excellently thorough. And it brought back the terror in such volume, it took me about a week to “fully” recover from the exposure. More than anything though, I wanted to find the girl who’d been standing beside me and uttered those callous words. I wanted to tell her how REAL it was. How PAINFUL it was. How TERRIBLE it was to be afraid for my life. I absolutely ached with the desire to point out every single “clue” that had been in those rooms and make it clear to her that she could end up experiencing the same turmoil if she didn’t watch out. If she didn’t open her sheltered, ignorant mind to the evidence that was staring her right in the face. While those rooms may have only been an exhibit, while those vlogs may have been completed by actors, it was very, very REAL. And the statistics are absolutely tragic. According to the National Coalition Against Domestic Violence, 1 in 4 women will experience domestic violence during her lifetime, and 1 in 3 female homicide victims are murdered by their current or former partner every year. Knowing what to look for early on and how to get out before it becomes violent can save countless lives. So the next time you think what you are seeing or hearing is dramatic, take some time to think about how traumatic it would be to experience first hand… and pay attention to the “clues”.